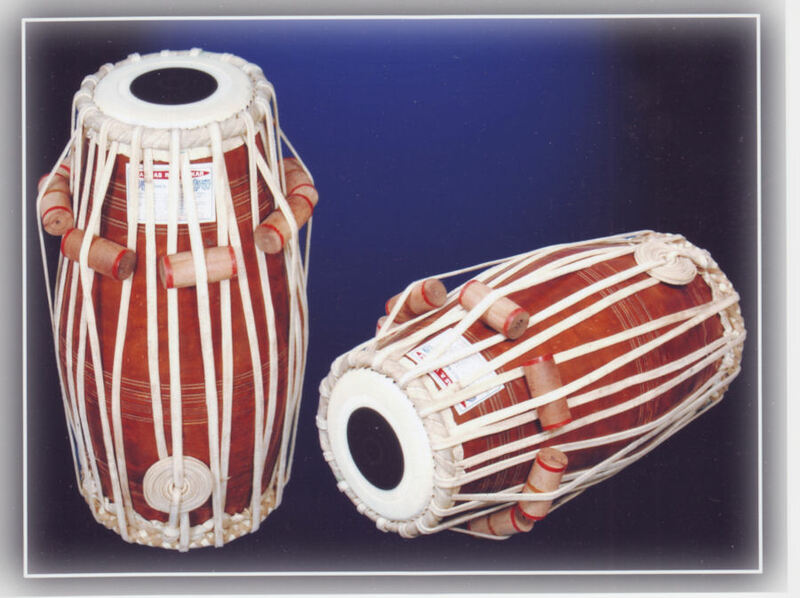 This is the highest quality Tabla used by such stalwarts as Ustad Zakir Hussain, Pandit Anindo Chatterjee et. al. Best quality wood is used. Guaranteed against cracking, deformation, fungus and pests. Best quality skin (Pudi) is used. 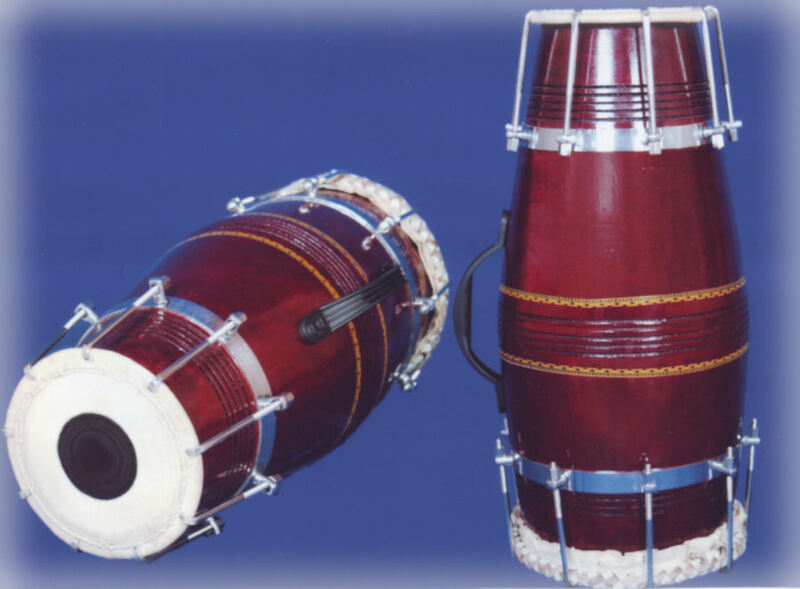 Perfect tuning of the "chaanti" (Rim) and "thaap"
All other raw materials used are best quality materials. This is the highest quality Dagga used by such stalwarts as Ustad Zakir Hussain, Pandit Anindo Chatterjee et. al. Best quality copper metal is used. Made out of single sheet and uniform guage of copper metal. Guaranteed against cracking, deformation. Best quality skin (Pudi) is used. Attractive embroidary / design on the entire outer surface. Inner layer of hard board for additional safety. Layer of foam for soft cushioning. Heavy hammer. Approximately 400-500 Gms. in weight. Wheels are attached for ease of carrying. Two handles are provided. One on the top and one on the side. Professional quality Tip (smaller pudi / skin / mouth) Tabla , Dagga (Baya), 2 covers, 2 rings, a hammer. Carry case is optional. 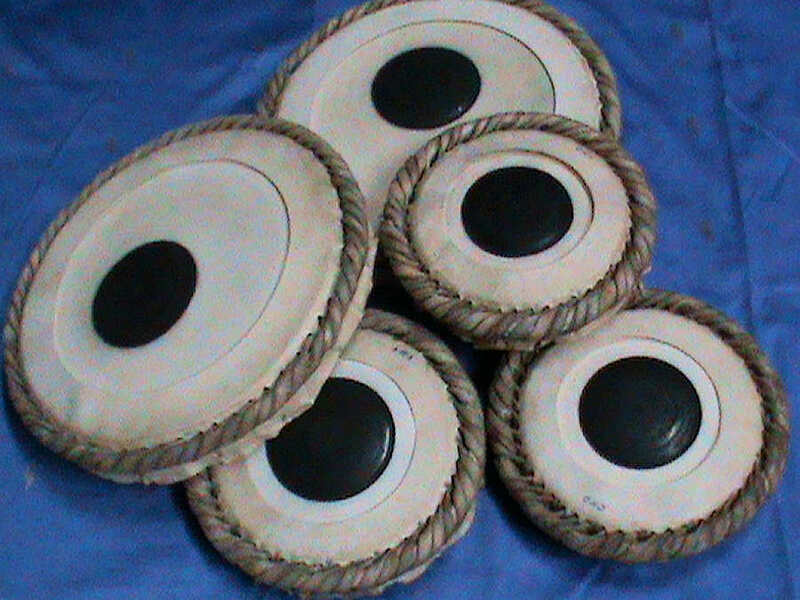 Professional quality Dhala (large pudi / skin / mouth) Tabla , Dagga (Baya), 2 covers, 2 rings, a hammer. Carry case is optional. This is the highest quality Tabla and Dagga Skin (Pudi) used by such stalwarts as Ustad Zakir Hussain, Pandit Anindo Chatterjee et. al. Best quality super fine skin is used. Guaranteed against defects and deformation. Single skin is used for the pudi and the inner layer beneth it to ensure uniform tonal quality. Best quality strings (gajra and vaadi) are used. Guaranteed against defects and deformation. Perfect tuning of the "chaanti" (Rim) and "thaap"
This is the highest quality Pakhawaj used by stalwarts. 9 - 9.25 inch Baya (base side). 6.45 - 7 inch Daya (tenor). Includes professional quality Pakhawaj, 2 covers, 2 rings, a hammer. Carry case is optional. This is the highest quality Pakhawaj Skin (Pudi) used by renowned artists and stalwarts. This is the highest quality Dholki used by top class professional artists. 8.5 - 8.75 inch dhumma (base side). Inbuilt handle for ease of carrying. 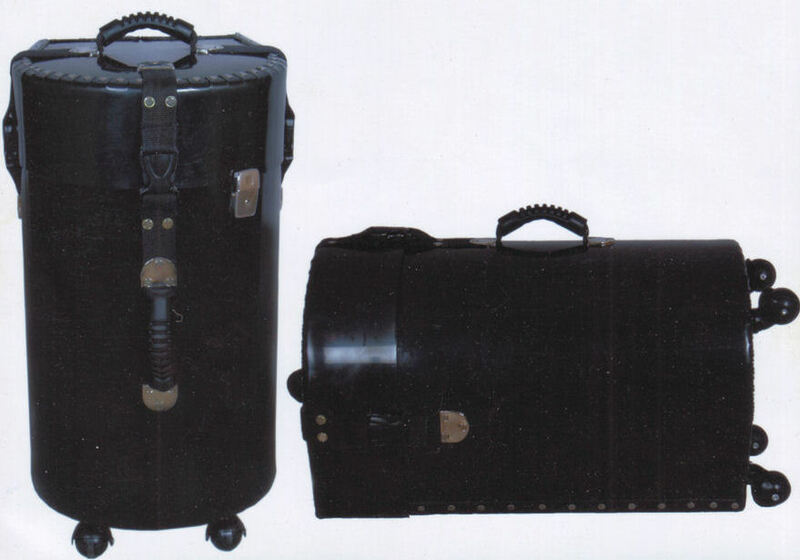 Includes professional quality Dholki, 2 covers, 1 spanner, bag. Carry case is optional. This is the highest quality Dholki Skin (Pudi) used by renowned artists and stalwarts. 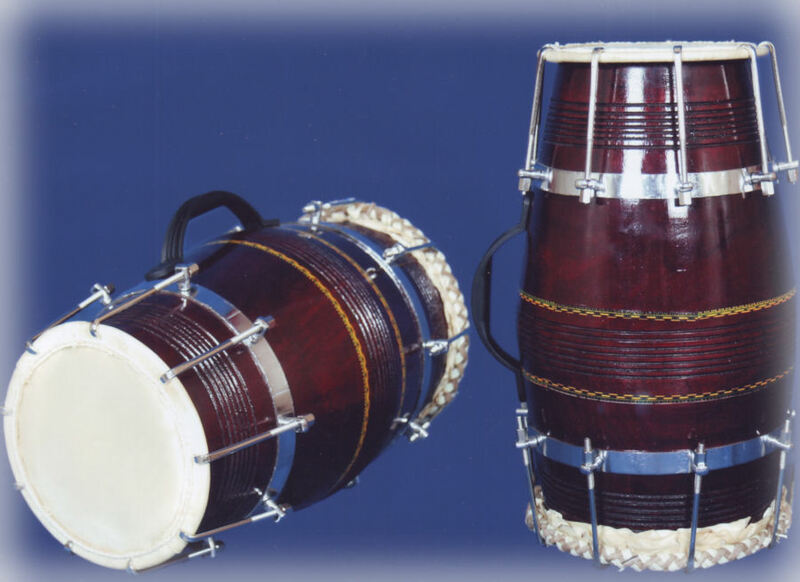 This is the highest quality Dholak used by top class professional artists. 6 - 6.5 inch Chaati (tenor). Includes professional quality Dholak, 2 covers, 1 spanner, bag. Carry case is optional. This is the highest quality Dholak Skin (Pudi) used by renowned artists and stalwarts.